Advanced or how I prefer to describe it, 'Custom Rod Building' adds a new dimension of quality, individuality and distinction to the finished rod. Whether you are the enthusiastic amateur building a rod for your own use or a professional Custom Rod Builder using their skills, the finished rod will be individual to the owner, it will carry the mark and style of the builder, the rod will stand out in the crowd. Walk along the bank, shore, pier or stand outside the Hut on the fly-fishing beat, the rod is yours and totally distinctive. Do not look to build a rod over night. There are plenty of stories of rods being built in one or two days, read the instructions on some finishes, they are touch dry in 6 hours, harden in 24 hours and fully cure in anything from 6 to 14 days and how many coats of finish are you using? Look at weeks not days to finish a quality rod. To the manufacturer with large drying rooms and dust control systems this is comparatively easy. I would not like to say just how many times I have had to deal with dust particles, midges or flies being encased in the resin finish. Equally how clean are your hands, are they contaminated with grease or oil etc from doing the car or other work, how rough is the skin on your fingers - those snags and breaks in the skin are just waiting to pull on a loose thread. How clean is the blank, there is no harm in giving it a good wash with hot water and washing-up liquid, followed by rinsing in clean water. Contaminates. The one product not permitted near my work area - Silicone. It will contaminate just about anything, adhesives will not hold and resin finishes will go 'smokey', just for starters. These will test your ingenuity. All resins, either one or two part are self-leveling. Thus when you put the resin on a round blank it will run to the underside giving a 'tear-drop' effect. The only remedy is to rotate the rod blank you can complete the turning by hand, rotate the rod every 30seconds (to start with) for the next 4 to 6 hours, the most effective method is to employ a motorized rod turning machine. These are available commercially or for the home engineer there are a variety of small motors on which to build one, the most popular motor is from the rotisserie on a BBQ. Again read the instructions, the manufacturer does know best on this occasion and if they state 'touch hard in six hours', the rod will require turning for six hours. Thread has two prime uses. 1. To hold rod rings to rod. 2. Decorative work to create an individual and distinctive rod. Thread is available in various grades of thickness; do not assume that you need the thickest available for sea rods and the finest for fly rods. Modern resins, which are derivatives of epoxy glues, permit fine thread to be used, as the resin will anchor the rod ring to the rod. In the USA most of the heavy 'Stand up sticks' for tuna and marlin fishing are being wrapped in two or three layers of 'A' thread (fine) as opposed to thicker 'D' or 'EE'. The colour range is limitless and this is probably the greatest need for testing. The majority of rods are wrapped in black or a similar dark colour, this is done to save time and cost, with no need to use colour preservative. To retain a light colour the thread needs to be treated with a colour preservative, at this point welcome to the argument that using colour preservative does or does not impede the ability of the thread and finish resin to hold the ring foot onto the rod. You can try to copy the Far East (Low cost end of the market) who are now whipping with white thread and using a colour die in the resin to achieve a colored wrap! Spools of thread are liable to have broken fibers so do not stint on your thread, a 100 yard spool will complete a rod easily, always have a second spool available just in case. You can throw out almost as much thread as you use on a single rod. Remember, when a finish is applied thread will change colour. The lighter the colour shade the more prone it is to become translucent, test before you start. If the product is new to you - test it, there is nothing worse than spending many hours getting the rod to look right than to find a new finish wrecks the effect you are trying to achieve. This is specifically important with thread, colour sealants and resin finishes. Short lengths of dowel or broom-handle are in valuable as the material on which to build test items. Remember the colour of the rod blank will also affect the finish colour of the thread when you have either a light or dark colour blank. Having chosen your blank and given it a good clean examine it for imperfections. They maybe slight but nobody wants the blank to explode on the first fishing trip. When you are completely satisfied set about choosing the following items. Reel seat - make certain the hoods will fit over the foot of the reel. (Yes I've been there, the customer changed the model of reel and I had to cut off and fit a brand new reel seat!). Select a set of rings best suited to the style of fishing the rod is to be used for and within the price range. I mentioned price range as a plain metal ring will wear quicker than a lined ring and the lined ring will cost progressively more as the overall quality of the 'liner or insert' increases. There are many excellent ranges of rod ring manufactured around the world, top of my list Fuji and Seymo. You now have you all the items you need to complete the rod. Good now we can start the preparation. If you search the Internet you will be able to hear or read every convincing argument for and against building a fishing rod 'On the spine'. I have listened to too many and fall in the camp of working with the spine of a rod. I will not dwell on it here. Have a read then make a decision on what you want from your fishing rod. Thankfully we are all different and contrary to belief, a short person may prefer a long reach on the handle of a surf rod whilst a taller person may like a short stubby hand reach. On a fly rod do you want the reel seat thread up locking or down locking? It will radically effect how you balance the rod at a later stage. Once comfortable set the reel seat in place using arbors for packing and a priority adhesive. Leave to one side for several days to set, then twist and tug on the reel seat to check it is firmly in pace. Now fit the handgrips, again permitting the adhesives to set fully. Check them for damage or marks. Do you have a grinding wheel on a lathe or similar, as you need a very fine abrasive disc to work on the tip of the ring foot or feet. Hold the ring upright on the blank, do both feet lie flat on the rod, if not gently bend the frame so they are flat to the blank. Now grind the tip of the ring foot to give a smooth shoulder to the foot. This will permit the easy transfer of the thread over the ring foot without it jumping and looking unsightly. After grinding and polishing smooth, should the tip of the ring foot be bright metal you can blacken or colour it. Test that the colouring agent does not bleed through the thread when finish is applied. You have chosen the colour and tested how it will look used with or without colour preserver. Do not be miserly with thread; it will give the most visual effect at the end of the day. Cut out blemishes, metallic finish thread can 'rough up or fragment' with a blink of the eye. If it happens, cut it off and start again. You have completed the basics of your fishing rod, everything is in place and ready for colour preservative and the first of the finishing coats. The custom rod builder will have completed a considerable amount of work prior to this point, and they include the following thread work, handle inlays and inscriptions. The finishing touches include entering your name as the rod builder, the name of the owner and class of rod. With a steady hand you can use a pen and ink process, there are others using computer inscriptions or waterslide transfers, those shown below are computer originated. 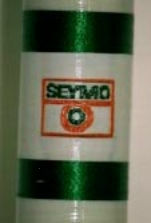 The 'Seymo' logo woven here was achieved at the second attempt and from drawing the original pattern to completing the finished logo took some 14 hours. Threads used are Fish Hawk 'A' thread for the Green, Metallic Green and Orange with Gudebrod 'A' Thread NCP White. Both the test work and this finished logo each contained over 140 threads worked on special 'rod looms' available only from the USA. Another example is in my boat rod 'Red, White & Blue'. See photo at top of this page. Here the Union Jack flag is again woven, this was some 24 hours work through development to finished flag. Wraps are somewhat easier and these are photographs from Conferences I have attended in the USA in recent year. The originators of the work are unknown. One other specialist effect is to put pictures into EVA foam handles. The result can be seen in the photograph of 'Red, white and blue' where the Union Jack flag has been inlaid into a red EVA grip. The USA has a master of this work, Bernie Cohen from Brooklyn, New York State. He has permitted his work to be displayed here and it clearly reflects the true 'artist' at work.